The Ace of Pentacles heralds the birth of energy in the material world and suggests abundance, health and stability. This Ace would suggest that whatever it is you are planning there are sufficient funds available. It is a time of financial abundance and material growth. Even though you may have to spend money, you are still able to hold onto some and have enough to go around. As Pentacles demand results for all their efforts, the Ace suggests that investment in new projects or ventures at this stage will be especially financially rewarding and yield a good return. Whatever it is you desire to do, rest assured that you are able to afford it when this Ace appears. Inheritance, gifts and financial windfalls can also be suggested. 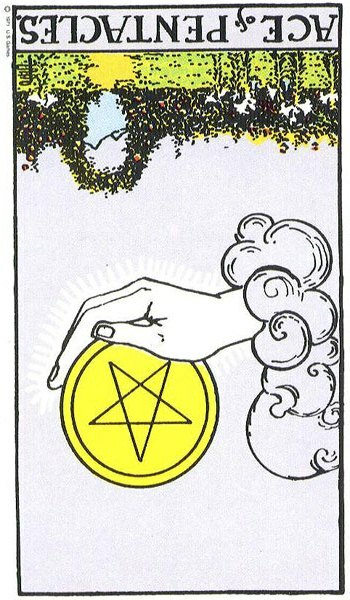 The hand holding the Pentacle in this Ace can suggest that you are saving for the future or putting a little contingency fund aside. 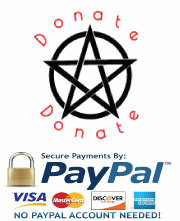 The saving suggested in this Pentacle would generally be for a large purchase such as a house or car. 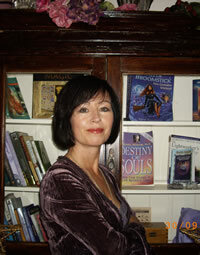 Pentacles like to invest in their careers and education so it may suggest saving for college or a particular course. Whatever it is will be rewarding and of value. The Ace of Pentacles can suggest that you are being cute and canny with your money. While everyone is going mad spending you may be holding onto yours waiting for prices to drop or holding out for a real bargain. You may be quite private about your financial affairs. The Ace of Pentacles in a health reading could indicate that you are investing in your health or physical body. You may be starting a new health regime or joinging a gym. If you have been worried about your health or have been ill then the appearance of The Ace of Pentacles happily announces the return of your vitality as you bounce back to health. It brings with it a great sense of stability and security in our life and relieves you from any previous worries. The Ace of Pentacles brings an opportunity for good fortune. Because the imagery depicts a walled garden environment, it may suggest that your prosperity will be found close to home or in your own back yard. However, the path leading to the hills is a temptation to even bigger and greater things. It is the Pentacles type who will have the stamina to take that journey in their search for financial gain and security. It is important to remember with any of the Aces that the gifts being offered are used wisely. Do not undervalue or overvalued this Ace of Pentacles. Do not let this gift and all it brings eventually possess you. Remember to stay grounded and practical. In a relationship reading the Ace suggests that you may be involved with or meet someone through your work or a solid grounded start to a relationship or to a new stage of a relationship. It can also indicate the start of a business relationship or a relationship that could lead to a business relationship with great financial rewards. The presence of this Ace in a relationship suggests that financial matters are important as in the pursuit of it or the acquisition of a comfortable lifestyle and surroundings. Money is definitely an important consideration in the deciding factor of this relationship. As a couple you may be saving to buy your first house or investing in a car. The relationship suggested by This Ace of Pentacles is grounded in reality and solid as a rock. This couple work well together and have common no-nonsense goals that they work steadily towards. It indicates a very stable and secure start to a relationship. This partner will definitely be around for some time to come and can be relied upon. In a career reading the Ace would suggest a new job with great financial rewards and prospects or having the money to proceed with a new business venture. Your hard work to date may be beginning to pay off. You may get a raise or a promotion as a result. If moving to a new job then the company are financially sound and well established. They may have a policy of investing in their staff through further training or scholarships. This Ace is steeped in groundedness and being down to earth. Your business may be getting off to a good start but you acknowledge that there is still a lot of hard work ahead. Keep your head down and put aside some finances for a rainy day. The Ace of Pentacles can indicate the initial or early stages of a career as in the dedicated, hardworking and ambitious college student or apprentice. The News the Ace of Pentacles brings will be of financial matters, job applications, loan approval, business contracts, investments, windfalls or inheritances. When this Ace is reversed, the hand can no longer hold the Pentacle or coin and it falls. It indicates a time when more money is going out than coming in. Opportunities may also be literally slipping through your fingers. There may be delays in starting a new project or venture due to a lack of money or difficulties in obtaining it. A financial institute could be taking its time in reaching a decision on approving your loan. The stability and security of the upright Ace is gone leaving you feeling vulnerable and stressed. You may be down on your luck financially, lost a job or can’t keep up with soaring prices. This may cause you to worry incessantly about money which can have you running around like a headless chicken in an attempt to sort it out. The more you worry about money the more scarce it becomes. You have lost your connection to earth and are unable to focus on anything in particular. This can have you starting many tasks but finishing none. You may have lost your routine and fallen into bad habits. You need to ground yourself and complete all unfinished work before you will start to feel better able to handle the situation and your life. You may also need to learn how to budget more efficiently. Make the money you have work for you. The Ace of Pentacles Reversed can often highlight that you are probably better at spending money than earning it. You may have squandered a fortune or inheritance. You may however be in the position of being initially good at making money but find that the success is always short-lived. Lessons need to be learned from this. There may also be a situation of not being able to put your money where your mouth is. This card stands for unsound and unstable financial institutes. If you are in the process of investing your savings, buying into a partnership or business venture then you would be advised not rush or be forced into anything. Appearances can be deceiving so check all small print and clauses. Take your time and do your own background searches. If not you may invest your money unwisely. There may be little or no return. On the other hand, The Reversed Ace of Pentacles can represent that time when the long period of saving is over and the time has come to withdraw or release the money in order to purchase the object of your desire. The purchase associated with the Ace of Pentacles would be large such as the buying of a house, land, business, car, holiday home etc. The reversed Ace sees the money going out. There is a flip side to this Ace in that it can double the bounty of the upright version by bringing in even greater financial benefits. There may be a chance to double your money or maybe the value of your possessions, stock shares or property has suddenly soared. What you have may suddenly be in extreme demand and you could be in a position to name your price. Lotto wins could be vast under the influence of the Reversed Ace of Pentacles or less than you spent on the ticket. Look to the other cards in the spread for signs of wealth and financial security. These will typically be Pentacle Cards such as the 9 and 10 of Pentacles, but the smug look of the man in the 9 of Cups could also suggest someone who is very happy with himself indeed. Although the Reversed Ace of Pentacles can double the Jackpot, it can also suggest wealth which is accompanied by extreme materialism, selfishness and greed. You may be defined by your possessions but can also end up enslaved by them. The Reversed Ace of Pentacles, like a lot of the Pentacle cards including the reversed Court Pentacles can suggest the corrupt use of money. When this Reversed Ace turns up in a relationship reading it can point to a lack of solid foundations between a couple. There may be a lack of commitment or it may possibly suggest that it has not got off to a good start. You may be working too hard or so much career focussed that you have little time to start a relationship or give time to a fledgling one you are in. There may be delays in plans for marriage due to financial reasons or having to save hard to afford it. Financial issues could be causing problems in the relationship. This card can often suggest that partners are chosen based on their material or financial status alone. Attraction may also be purely physical. Only those with good looks, prestige and excellent prospects may get a look on. This can all lead to shallowness, selfishness and greed. However, you may have started a new relationship only to find that it is financially draining you. You may be carrying your partner and have to pay for everything. Health wise, the Reversed Ace of Pentacles can indicate that your are not looking after yourself or that you have not kept up a new health regime started. Your health may be suffering leaving you feeling run down and lethargic. You need to get back on track and keep motivated. This card can suggest that you are struggling to recover after an illness. You may think that you are improving one day only to find that you feel terrible the next. There could be delays, setbacks or a reoccurrence of an illness. The news this reversed Ace brings will be of loan approval declined, falling stock shares, job loss, an inheritance that is disputed, mortgage increases or on the flip side, lottery wins and windfalls. The Ace would indicate an ungrounded job offer or a job offering poor financial prospects. It may also indicate that you are about to leave or have already left a job. You may be highly qualified and work hard but get paid very little for what you do. On the other hand, you may lack the necessary qualifications to land the job of your dreams. You may have great plans and ambition but there may not be enough money to pursue a new project or business. Work wise, the Ace of Pentacles Reversed often highlights underhand or shady business deals. You may be taking money under the table or involved in doctoring the accounts. You may also be stuck in a rut job-wise. The money may be good or your business prosperous but it does not bring you happiness. 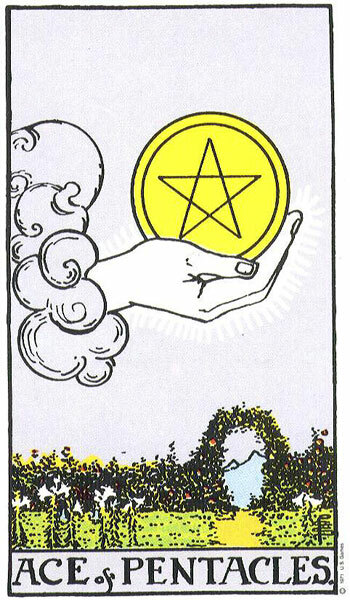 In the Upright Ace of Pentacles we see the sense in putting a little money aside for a ‘rainy day’ but in the reverse it points to the opposite. You may have no contingency fund to fall back on when business is slow or times are hard.